To mitigate the traffic congestion caused by thousands of work zones across the nation each year, the Federal Highway Administration has been promoting accelerated bridge construction. ABC techniques can slash lane closure times from months to hours for a given structure. ABC is replacement or new bridge construction that uses innovative design and construction methods and high-performance materials to reduce the typical length of time of onsite bridge construction while maintaining—and often improving—quality. Now, the Utah Department of Transportation has launched an initiative to make ABC standard practice by 2010. To help Utah standardize its ABC designs and methods, the state hosted the “UDOT Accelerated Bridge Construction Standards” workshop in Salt Lake City. More than 80 people attended the January workshop, many of them national authorities on bridge and highway construction. FHWA co-sponsored the workshop. The ABC program closely complements Highways for LIFE. In fact, one purpose of the HfL program is to encourage use of innovations that get highway projects done faster and reduce lane closure times. That leads to shorter work zone durations and increased safety for workers and traffic alike. Making ABC standard practice—a national goal envisioned by FHWA—fulfills another HfL goal, which is to incorporate innovative construction techniques into mainstream construction. Nationally, more than two dozen states have completed more than 200 projects using the ABC method, said Vasant Mistry, FHWA senior bridge engineer. “Utah's effort to make ABC standard practice provides an excellent example for other state DOTs,” Mistry said. Utah itself has built 10 projects using ABC techniques. For most, contractors replaced bridge decks by lifting precast concrete deck panels into place. The panels were cast either at precast yards or at sites near the actual structure's location. ABC helped UDOT replace a bridge deck in one weekend. Utah's most spectacular ABC project involved replacing the bridge at 4500 South over Interstate 215 in Salt Lake City. Contractors built the entire superstructure at an adjacent staging area. New substructure elements were built to support the new structure underneath the existing bridge. In one weekend, the old bridge deck was removed and replaced with the new structure. Structure removal was accomplished partly with hydraulic breakers and partly with self-propelled modular transporters. Then the SPMTs moved the new span into place. The workshop helped UDOT come up with programmatic ideas and goals that will allow the agency to implement ABC as its standard way of building highway structures, McMinimee said. Currently, UDOT is working on precast deck panel standards and on performance standards for SPMTs. For more information on UDOT's accelerated bridge construction standards, including presentations from the ABC workshop, visit UDOT ABC Workshop Report. Using the design-build delivery method will compress the construction schedule for a new Interstate interchange in Georgia to about 18 months. Use of the design-build delivery method is cutting at least a year from the normal construction schedule to build an Interstate highway interchange in Georgia. 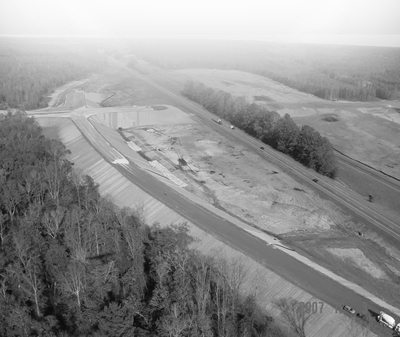 The highway project, one of the first in the state to use design-build, is a new interchange on Interstate 85 at Gabbettville Road near LaGrange, Ga. The $80.9 million project includes frontage roads and two bridges. For its use of innovative contracting and construction technologies on the project, the Georgia Department of Transportation has received a grant from the Highways for LIFE program, a Federal Highway Administration initiative to encourage innovation, safety and speed of construction. C.W. Mathews Contracting Co., the designer-builder, started work on the project last June and plans to complete it on schedule by this December, said Gus Shanine, transportation manager for FHWA's Georgia Division. Mathews is working under a program of incentives and disincentives that are expected to bring total construction time to 18 months. With the conventional design-bid-build method, it would take about a year for the state to design the project, and then construction would begin. That entire process could take 24 to 30 months. Another time-saver will be the use of precast concrete bridge components and precast concrete drainage structures. Using precast columns and pier caps for the bridge on Gabbettville Road over I-85 will eliminate the curing time normally required for cast-in-place concrete. “They will be pouring the bridge decks by mid-summer,” said Shanine. 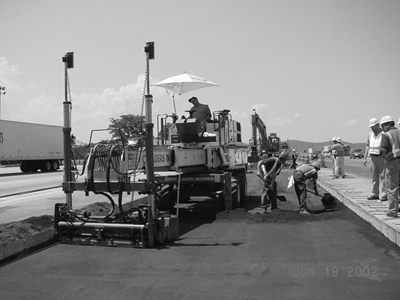 The Georgia DOT is encouraging the contractor to use other innovative techniques such as roller-compacted concrete on shoulders. Advocating contractor use of innovative materials and technology as part of a predesign proposal is new for the agency. The construction plan calls for traffic disruption on Interstate 85 to last no more than six months, Shanine said, which will minimize inconvenience to the traveling public. I-85 lane closures will be limited to nighttime hours and off-peak hours during the day. To improve worker safety, concrete barriers will be used to cordon off work zones instead of cones or barrels. In its proposal, the Mathews firm was required to provide the elements and process to evaluate a goal of reaching a construction period speed band in which 75 percent of the traveling public through the construction zone would be within 5 miles per hour of the posted speed limit. Mathews also must monitor the worker injury incident rate during construction. Mathew's submittal provided the elements and process to evaluate a goal of having an incident rate of less than 4.0, based on the Occupational Safety and Health Administration's standard formula for calculating the incident rate per 100 full-time employees. At the quarter points of construction completion, Mathews is required by contract to perform user satisfaction surveys. The Georgia DOT has set a goal that 80 percent of the traveling public should be very satisfied to somewhat satisfied with the project. At the halfway point, the survey showed that 65 percent of the public was somewhat satisfied or better. “The contractor took some mitigation measures to address comments of the public, and they're hoping for a better result in the next survey,” Shanine said. For more information, contact Gus Shanine at (404) 562-3632 or gus.shanine@dot.gov. Using innovations can boost safety and quality and ease congestion on highway construction projects, but getting the word out about new technologies and practices to those who would benefit can be a challenge for highway organizations. Many in the highway industry are finding that developing and implementing a solid marketing plan can encourage wider acceptance and application of innovations, moving them from state of the art to state of the practice more quickly. “That's the idea behind the Highways for LIFE program—getting everyone in the highway community to be open to applying innovative technologies much faster,” said Kathleen Bergeron, marketing communications coordinator for the Federal Highway Administration program. FHWA is using a marketing approach to deploy innovations under Highways for LIFE, including road safety audits, prefabricated bridge elements and systems, and making work zones work better. Teams of experts from a variety of disciplines collaborated on plans for each innovation and are now carrying out those strategies. In developing their plans, the teams used the approach outlined in a new FHWA publication, Guide to Creating an Effective Marketing Plan. The guide offers step-by-step instructions that any agency or organization can use to develop marketing plans for deploying innovations and other highway-related initiatives. Marketing focuses on letting people know you have something worthwhile to offer that they want or need. It involves identifying target audiences, analyzing their needs, and then developing strategies to mesh your product or service with those needs. For marketing innovation in the highway industry, the emphasis is twofold: helping target audiences understand the technologies or practices and their benefits, and encouraging them to make the technologies part of standard operations. The key to success, said Bergeron, is to center the marketing plan on how the technology or practice will benefit target audiences from their perspective. “That way, the plan will naturally focus on strategies that not only increase awareness, but also encourage audiences to embrace the innovation,” she said. To develop a plan to market an innovation or initiative, start by building a team that includes leaders in the organizational area in which the technology falls, those who will deliver the technology and individuals with marketing and communications expertise. “The team leader should be a highly respected, motivated individual who can bring everyone together,” Bergeron said. Identify and define target audiences. They include the beneficiaries and users of the innovation, as well as the decision-makers who need to be convinced to adopt the innovation. Do market research. Collect information about the audiences you've identified and industry conditions, including market dynamics, current practices, obstacles to and opportunities for adoption, and potential champions. Write a concise mission statement. Describe the innovation in the target audience's language. State who benefits from, uses and makes decisions on adopting the innovation; how the innovation solves a problem; and what its benefits are. Develop a strategy. Include marketing tactics and delivery channels to reach each audience, such as networking, presentations, demonstrations, peer-to-peer exchanges, publications and websites. Also include quantifiable and measurable goals. Set a budget. If resources are limited, determine which segments of the broader transportation community will benefit most from the innovation and focus the dollars on them. Determine how to evaluate success. Establish how you will monitor results so you can identify the strategies that are working and modify those that aren't. Once the team has gone through the plan-building steps, it's time to put the plan on paper, review and refine it, and then carry it out. FHWA's Guide to Creating an Effective Marketing Plan includes a sample marketing plan outline, as well as three complete plans developed to promote technologies under the Highways for LIFE program. It's available at www.fhwa.dot.gov/hfl. The marketing guide is also part of the new Highways for LIFE toolkit, “Transforming America's Roads and Bridges.” For a copy, e-mail HfLT@dot.gov or call (202) 366-0131. For more information, contact Julie Zirlin at (202) 366-9105 or Julie.Zirlin@dot.gov. Videos on road safety audits and prefabricated bridge elements and systems are included in “Transforming America's Roads and Bridges,” a new toolkit of Highways for LIFE resources. The videos feature real-life examples of how the technologies are being used to enhance safety and quality and reduce congestion on the nation's highways. 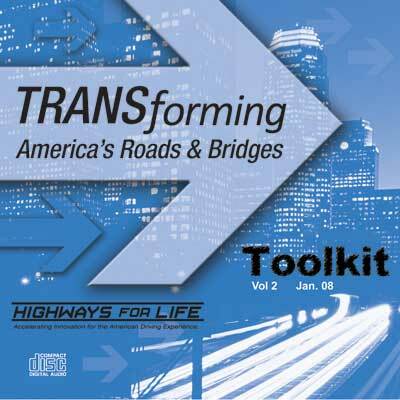 The toolkit, in CD format, also includes “Driving Innovation” and “In Search of the Perfect Highway,” presentations on the goals and philosophy of the Highways for LIFE initiative. In addition, the CD has articles on the HfL program and highway construction innovations, links to program information and contacts, and the Guide to Creating an Effective Marketing Plan (see “Marketing Strategies Help Deploy Innovation” on page 4). To obtain a copy, contact the HfL team at HfLT@dot.gov or call (202) 366-0131. Work zones are essential to fix and upgrade the nation's aging highway system, but when those orange construction barrels appear on a road, motorists know they're likely to be in for a time of increased traffic congestion and safety hazards. 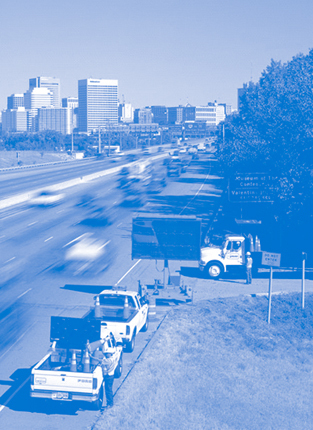 To mitigate the impact of work zones on the public, the Federal Highway Administration's Office of Operations and Highways for LIFE program are collaborating on a “Making Work Zones Work Better” program. The program, also known as MWZWB, is designed to help highway agencies better understand the potential impact of work zones, improve their work zone management programs, and use innovations to lessen the negative effects of work zones on the public. MWZWB is also intended to help agencies implement the regulations and spirit of FHWA's Work Zone Safety and Mobility rule. The goal of that rule, which applies to all state and local governments that receive federal-aid highway funding, is to reduce crashes and congestion in and around work zones. Dozens of innovative approaches and products are available to address safety and mobility challenges in work zones. They range from sophisticated electronic equipment to notify drivers of real-time road conditions to innovations in construction processes to finish projects faster. To accomplish this, MWZWB focuses on enhancing technology transfer with a peer-to-peer program through which agencies can get help from experts on using innovative work zone strategies and technologies, as well as advice on implementing the work zone rule. An agency may request help by e-mailing workzoneP2P@dot.gov or calling (866) P2P-FHWA. The P2P coordinator will match the agency with a transportation professional who can offer onsite or over-the-phone advice. Another MWZWB feature is focused technical assistance workshops to enable states to collaborate with experts to solve work zone challenges. These workshops will be designed to provide states with tailored assistance on enhancing work zone safety and mobility practices, either at the program level or in specific areas. FHWA is working with selected states to test and refine the concept. FHWA is also developing resources to help states conduct work zone impact analyses, which are used to identify projects for work zone innovations and select appropriate strategies for these projects. The resources include a primer, case studies, and guidance on choosing and using traffic analysis tools to help plan, design and operate work zones. For more information on work zone safety and mobility, visit FHWA's website at ops.fhwa.dot.gov/wz/index.asp. It includes details on best practices, design and construction strategies, performance measurement and the work zone rule. The National Highway Institute at www.nhi.fhwa.dot.gov offers several courses on work zones, including “Advanced Work Zone Management and Design” (FHWA-NHI-380072), which covers work zone planning, design, project management and contract issues. For work zone safety data, research, products, practices and expert contacts, visit the National Work Zone Safety Information Clearinghouse at www.workzonesafety.org. For more information, contact Chung Eng at chung.eng@dot.gov or (202) 366-8043. The Minnesota DOT used full road closure when it rebuilt part of busy Highway 36 in North St. Paul. One strategy highway agencies use to make work zones work better is full road closure, an approach designed to eliminate the exposure of motorists to work zones and workers to traffic by temporarily closing a road for rehabilitation or maintenance. Traffic is detoured during a full road closure, allowing construction crews full access to roadways or bridges. A full-closure strategy can be an effective way to reduce traffic congestion caused by construction, finish projects faster, improve quality, and enhance safety for motorists and highway workers. Work zones are essential, but they account for nearly 24 percent of nonrecurring congestion, or 482 million vehicle hours of delay each year. From 1982 to 2002, route miles of highway increased 3 percent while vehicle miles of travel jumped 79 percent. The combination of more work zones and heavier traffic means construction congestion is having a greater impact on roadways. Despite the growing need for work zones, construction congestion frustrates motorists. In a Federal Highway Administration survey, Americans cited work zones as second only to poor traffic flow in causing dissatisfaction with the roadway system. Safety is also an important work zone issue that affects both travelers and construction workers. In 2006, 1,010 fatalities occurred in work zones. More than 40,000 people are injured each year in work zone crashes. Full road closure helps highway agencies balance the need for work zones with concerns about mobility and safety. The full-closure approach can be used for an extended time period, on weekends or nights, or in one direction at a time to reduce the impact of work zones and speed construction. In situations with adequate alternate travel routes, a good traffic management plan and effective public outreach during the project development and construction phases, full closure can be a viable alternative to typical construction approaches. In traditional part-width construction, at least one lane of traffic in each direction is kept open while work is underway on other lanes. The Minnesota Department of Transportation used a five-month closure to cut 60 percent from the timeline to reconstruct a section of Highway 36 in North St. Paul. The closure also cut project costs by 15 percent and resulted in a better quality highway. The Delaware DOT rehabilitated a six-mile stretch of Interstate 95 in Wilmington by shutting down the road in one direction at a time, reducing construction time from two years to 185 days. The Missouri DOT used a full-road closure when it replaced the Choteau Bridge in St. Louis. The two-year project, which included a strategy to maintain access to area businesses, was completed ahead of schedule. The Oregon DOT opted for full closure in one direction at a time when it repaved the Banfield Freeway in Portland, the busiest road in the state. The agency completed the project in two weekends instead of the 32 nights it would have taken using traditional part-width construction. The Michigan DOT used full closure to speed construction and improve safety when it rehabilitated part of the Lodge Freeway in Detroit. The closure saved 75 percent on traffic maintenance costs during construction. For more information on full road closure strategies and case studies, visit FHWA's website at www.ops.fhwa.dot.gov/wz/construction/full_rd_closures.htm.